Does the PS4 Pro Play Blu-ray? Can PS4 Pro play Blu-ray? It depends. Seeing as Sony is basically the inventor of Blu-ray and the PlayStation 3 is the first official Blu-ray player(and even the cheapest one once), it’s natural for PS4 Pro, the successor of PS3, to support Blu-ray. But there are exceptions. Does the PS4 Pro play Blu-ray? Yes and no. Yes, it can play most of the Blu-ray discs out there. And no, it can’t play 4K UHD Blu-ray discs. At a time when even its competitor, the Xbox One S, supports 4K, Sony still chooses to exclude the feature from its iconic game console. It may be a bad decision for Sony to abandon 4K support on PS4 pro but it’s something fans will have to accept. Does the PS4 Pro play Blu-ray? If you count playback of a converted 4K video from a 4K Blu-ray disc as support of 4K Blu-ray, then the answer is yes. Sony released an update to the PS4 Pro system which allowed the game console to support playback of 4K videos via streaming and storage media, meaning that you can play a 4K video from your USB sticks with PS4 Pro. But the 4K video must be in MP4 format. With this update, you can choose to rip your 4K Blu-ray movie to MP4 and transfer it to your USB stick to play on your PS4 Pro. That’s one good way to get around the 4K Blu-ray disc playback issue of the PS4 Pro. As the update is out, the answer to the question: “can PS4 Pro play Blu-ray?” would be yes. But how can you rip 4K Blu-ray to MP4? Here’s the answer. Does the PS4 Pro play Blu-ray? Yes, it can even play 4K Blu-ray if you can find the way to make it happen. To rip 4K Blu-ray to MP4, you are going to need help from a high quality Blu-ray ripper. Leawo Blu-ray Ripper would be the perfect choice. It can rip Blu-ray to MP4 in 4K resolution with minimum quality loss. If it weren’t for that the PS4 Pro can’t play MKV, I would totally recommend that you use Leawo Blu-ray Ripper to rip 4K Blu-ray to lossless MKV even the resulting video file will be incredibly large. 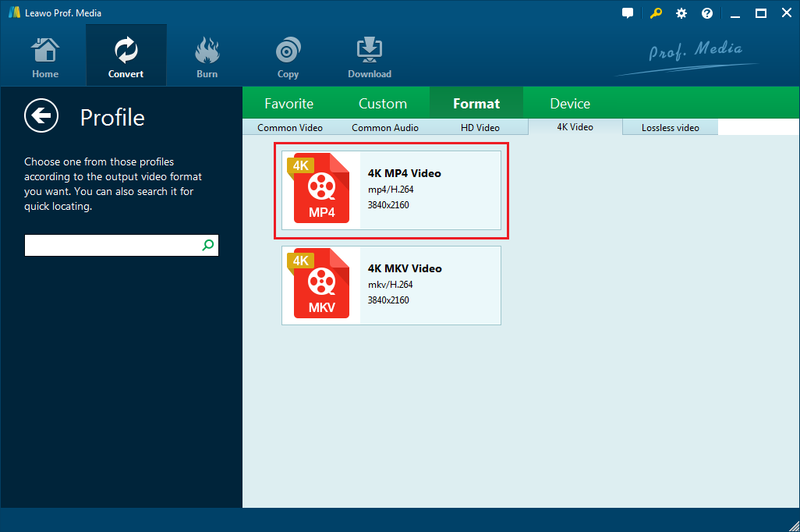 It also provides other common formats for you to convert your Blu-ray movie into for playback on other devices. 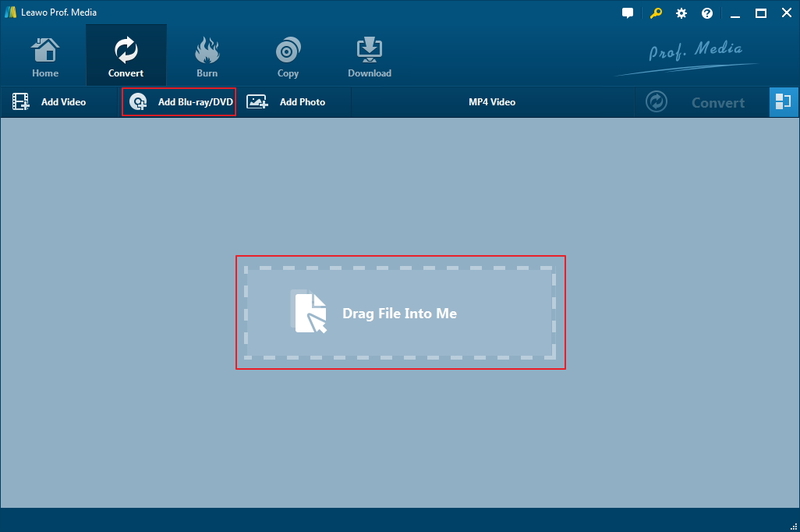 For example, you can rip Blu-ray to common MP4 video to play on your iPhone or Android phones if you need. Check out how the program works in the content below. Make sure the criteria listed below are met before you start using the program to rip 4K Blu-ray to 4K MP4. 1. Make Sure the disc drive you use on your computer is a Blu-ray drive. 2. 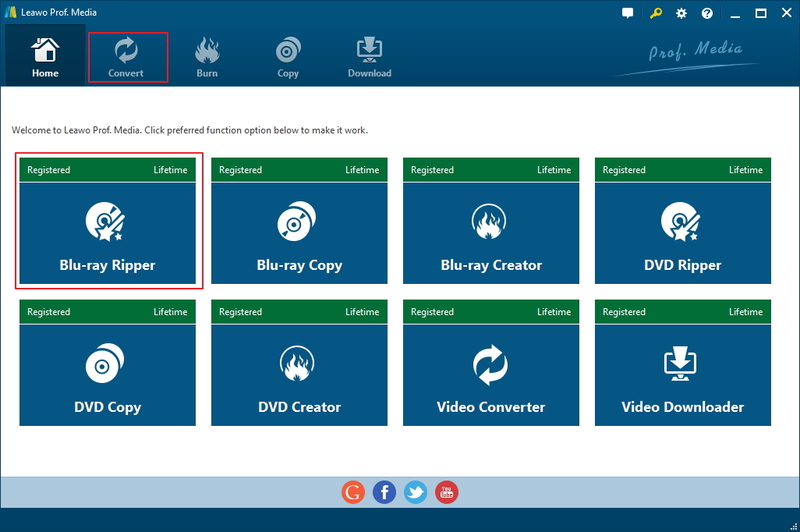 Install Leawo Prof.Media on your computer as Leawo Blu-ray Ripper is part of this software suite. And then register the program within Prof.Media to get the program ready for usage. 3. Make sure you have enough storage space on your hard drive for the 4K MP4 video as it’s going to be larger than you’d expect. 4. Make sure your USB stick is big enough for the 4K MP4 video. Step 1. Launch Leawo Blu-ray Ripper from Leawo Prof.Media. There’s the Blu-ray Ripper tab on the interface that you can use to load the module. Or click the Convert button above the 8 tabs to get to the program’s interface. Step 2. If the 4K Blu-ray disc is ready, you can load the data in it to the program by dragging the Blu-ray folder directly to program. Step 3. The program will display a list of all the videos in the Blu-ray disc. If you don’t planning on watching all of them on your PS4 Pro, then you can choose Main Movie button from above the list to exclude all videos other than the main movie. You can also convert all the videos to 4K MP4 by selecting Full Movie, and they can be merged into one video later if you need. You can also use Custom Mode button to pick the videos you need from the list manually. You can also play the videos in the disc with the video player on the right. Click OK and the chosen videos will be shown in the ripping list. Step 4. On the right side of the green Convert button is the button that can merge all videos, click on it again and the videos will be separated again. On the left side of the Convert button is the button we need for changing the output format to 4K MP4. Just click on it and click Change on the menu that appears later. On the following panel, go to Format>4K Video and click on 4K MP4 Video. You will find that the format shown on the button you previously click is changed to 4K MP4 Video. Step 5. Click the Convert button we mentioned before and when a sidebar displays itself from the right, you will see the default output directory on it. You can change it by clicking the “…” button. And all that left to do is click the Convert button on the sidebar to start converting the 4K Blu-ray disc to 4K MP4. Can PS4 Pro Play Blu-ray, most people would think that it would support all the Blu-ray discs, but the fact is it’s not. If you do want to watch 4K Blu-ray on PS4 Pro, follow the instructions above and enjoy watching movies in 4K resolution on your PS4 Pro.